On Monday I mentioned that Revlon posted a tweet reading "So, just tried our newest nail enamel coming out in April and ..well if you loved Perplex, you'll be obsessed with this shade. Obsessed." As if that didn't get me excited enough, now they just posted "Here she is..Black With Envy..in stores this month through May..run!" Here are some pictures from their Twitter feed--not the best quality, but it looks like a black-based emerald green to me. Also mentioned on their Twitter feed when asked what type of display it would be in, "That's the other amazing news..Black With Envy will be sharing a display with a VERY special friend. More to come on that." My guess is that Obsession--if that's the name of the Perplex-referenced polish--will be the special friend. 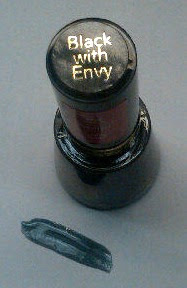 But then again, they said that one won't be out until April, and that Black With Envy is available in stores now. Oh Revlon, why do you do this to us?!! Nothing better than the announcement of a couple of LE Revlon shades to get my adrenaline pumping! Let's hope we all have good luck in our hunt for these! ouuuu ^^ thanks for sharing! i like revlon nail pol/! Oooh I just wrote a post about how much i love Revlon nail polish haha =) I'm excited for these! that swatch looks a whole lot like Sephora OPI's Dark Room. Hoping this one looks a little slightly more green on the nail. What a clever name if it is akin to the color you described. And after I bought Perplex, I've started to get a new found apperciation for Revlon polishes. As a result I picked up "Plum Night" and "Not so Blueberry"...love both. Thanks for posting! Tamara, that is exactly what I thought when I saw it. Is this supposed to be a Black Pearl lookalike or...what? I'm confused. It just kind of looks like a normal black here. I am eager to see this IRL. I don't have anything in my stash like this so I think it will be a nice addition. I'm guessing this is supposed to be a dupe for Black Pearl, which I haven't like that much in the swatches I've seen, but I'll probably get this if I find it. Now I just want to know what the other polish is! But I'm still gonna be keeping my eyes peeled in stores. Thanks for the heads up! A black base with green shimmer? I think Hard Candy Envy is probably pretty amazing on that score. Sadly, Revlon regular formula and I are chemically incompatible, but I love the idea behind the polish! I want that one! I still haven't found Perplexed. Haven't been lucky lately with drugstore polishes. I'll have to see this one in person. Neat! Lucy, have you tried at a Big Lots near you? They have been showing up there recently but sometimes you have to dig through the mess to find them. I found three of them at a Big Lots near my sister's house and was so excited to finally get it! My first thought was Black Pearl too, since they copied Channel with the first one. But, it doesn't seem "pearly", so maybe they are going after NARS this time and it's a Zulu dupe? There are some pictures floating around showing it sharing a display with Fashion's Night Pout! yes, it's with a lipstick - got both at walgreen's - didn't want to pay full price but hey!